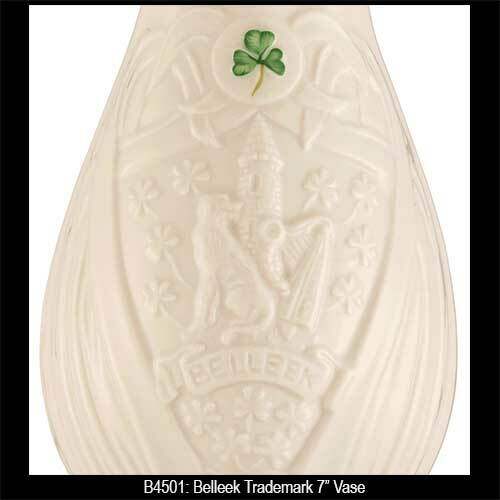 In commemoration of Belleek's 160th year The Irish Gift House is proud to offer the Belleek Trademark Vase that is complete with icons of Ireland including the shamrock. 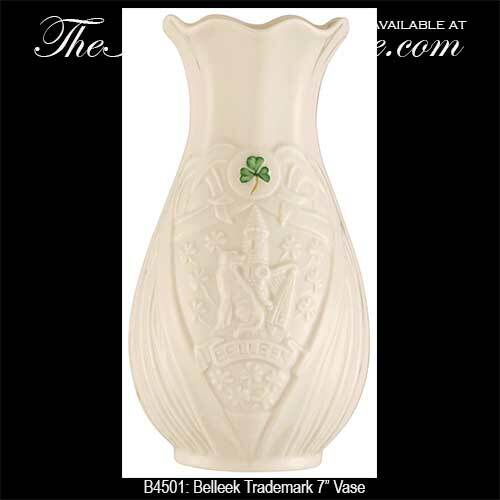 The Belleek trademark vase was introduced in 2017 and is the Belleek 2017 Edition Piece. The Belleek trademark vase is the 2017 Edition Piece and it memorializes the 160th year of the Belleek Pottery on the banks for the River Erne in County Fermanagh in Ireland. This fine china vase stands 7" tall and features the icons of the Belleek trademark in relief on both sides. The Belleek trademark is celebrated with the ubiquitous round tower, a harp and an Irish wolfhound along with shamrocks. 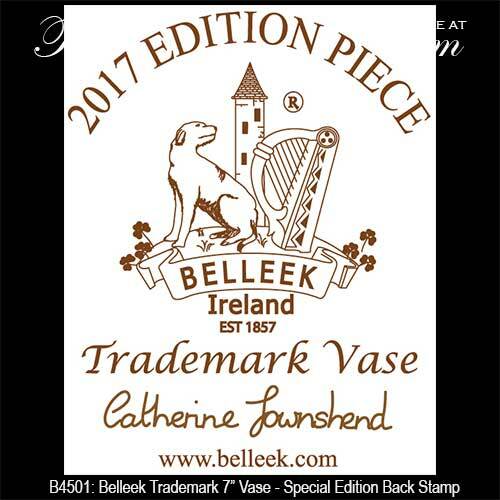 A special edition back stamp with Belleek designer Catherine Townsend's signature is present on the bottom and one hand painted green shamrock, classic of Belleek China, is prominent on one side of the vase. This Irish vase is handmade and hand crafted in Belleek, Ireland and is gift boxed with a shamrock history card that is complements of The Irish Gift House.